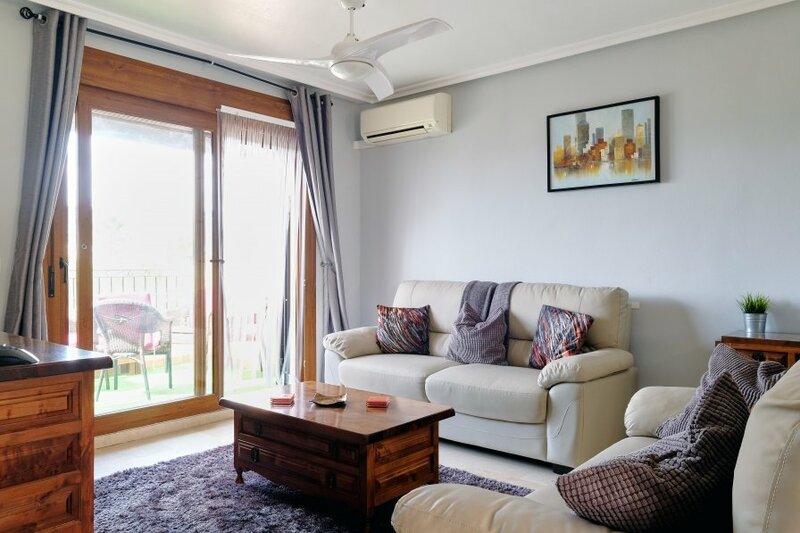 Air con in bedrooms and living room and ceiling fans in bedrooms and living room. Electric radiator heater in living room. 2 bedrooms with one on-suite bathroom, accommodates is for 4 persons, 1 Double bed and a twin bedroom. Community has off road parking and security gates. The apartment has been refurbished, we have installed LED lighting new sinks in the bathrooms and new beds and mattresses. The living room has been repainted with new sofa and a smart TV, Wifi is available inside the apartment and on the solarium. The roof terrace has great views of the La Finca golf course and hotel, its south facing and becomes a great place to catch some sun, there are 2 sun loungers and a sofa seating area, the floor is covered with fake grass to add to comfort so no burning tiles.